Photographed by Doug Harding. Copyright: The Dean and Canons of Windsor. When Sir Robert Dudley’s famous sea atlas Dell’ Arcano del Mare (‘On the Mystery of the Sea’) was published in Italy in 1646-1647, its author was over seventy years old. Written in Italian and illustrated by Antonio Francesco Lucini with over 200 engraved plates and 146 charts, the pioneering maritime encyclopedia had taken over twelve years and 5000 lbs of copper (used for the engravings) to complete. It was the culmination of a lifetime’s interest in navigation and engineering and many years of practical seafaring. The illegitimate son of Elizabeth I’s favourite Lord Robert Dudley, Earl of Leicester, with Lady Douglas Sheffield, Sir Robert Dudley (1574-1649) developed an interest in things nautical at an early age. His fascination with charts and instruments developed into a lust for exploration and in 1594 he set out on a voyage of discovery to Trinidad and the Guiana coast. Two years later, in 1596, he was knighted by the Queen for his part in naval operations against Spain. However, having failed to prove his legitimacy and his claim to his father’s and uncle’s titles in the English courts, he exiled himself to Italy in 1605. There he entered the service of Ferdinand I and his successor as Grand Duke of Tuscany, Cosimo II, as naval advisor and engineer, building up a modern Tuscan navy, constructing a state-of-the-art harbour at Leghorn (Livorno) and draining the marshes between Pisa and Leghorn before his death in Italy in 1649. However, his most lasting legacy was to be his maritime encyclopedia, Dell’ Arcano del Mare, the first edition of which forms one of the treasures of the Chapter Library (SGC RBK D.210). Published in four volumes, the work represents a compendium of contemporary navigational knowledge and was pioneering in a number of ways: it was the earliest printed sea atlas to cover the entire world; the first compiled by an Englishman; and the first to base its charts on the map projections used by Mercator. Equally remarkable was the fact that it was written in the Italian language by Dudley himself; that the maps were all his own; and that, in the first edition, many of the charts have movable parts (‘volvelles’). The range of topics covered is also impressive, from navigational matters, including longitude and astronomical aids, to shipbuilding and naval and military discipline. 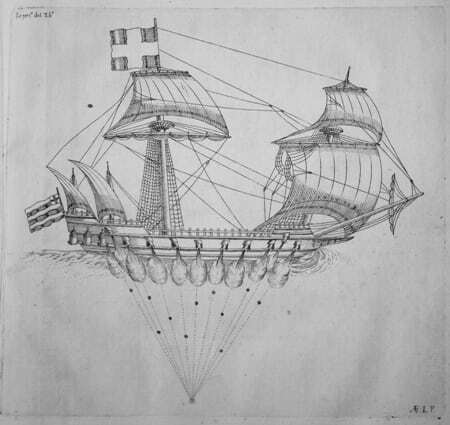 The work includes a proposal for constructing a navy in five rates, designed and described by the author with the use of engravings, the featured image (from volume II) demonstrating the most effective way of firing canon from a naval vessel. The sea atlas contains both general ocean charts and detailed surveys which not only delineate world coastlines but also show prevailing winds, currents and magnetic deviation. Dell’ Arcano is a magnificent work, both in terms of scholarship and visual appearance, and the Dean and Chapter’s copy has been much studied and appreciated by academics and laymen alike.